A FAILED plan to build a council-run nursery is back on the table after Cllr Gordon McCaskill (Conservative) voted with the council and supported a new plan. However many are questioning his motives, were they personal, and if so many local residents who object to the plans will suffer due to this. The new planning application for the 110-place facility at Newford Grove near Busby was submitted by East Renfrewshire Council. Residents claim the access road to the centre is too narrow to handle the high volume of traffic and that the development was too close to neighbouring houses. There were also concerns that bats were roosting in nearby trees. However planners returned with a revised proposal and they were considered by ERC�s planning committee today (Wednesday) at 2pm in the council chambers. Jackson Carlaw, Tory MSP for West of Scotland, has spoken out against the proposal. He said: �It is truly unbelievable, if not entirely surprising that East Renfrewshire Council has, once again, decided to completely ignore the genuine concerns of the residents of Newford Grove. The original application was rejected by a vote of three to two, with East Renfrewshire provost Alistair Carmichael, and Tory councillors Barbara Grant and Stewart Miller voting to reject them and Labour councillors Kenny Hay and Paul O�Kane motioning to approve them. Last weeks PAC Meeting saw the application being opposed by concillors Stewart Miller (Con) and Barbara Grant (Con) and Alistair Carmichael (SNP). Kenny Hay (Lab) Paul O'Kane (Lab), Betty Cunningham (Lab) and Gordon McCaskill (Con) voting to approve. Not only did Councillor McCaskill vote against the residents who state that they are in support of the building of the facility at that location, they only wish the entrance / exit to be moved for safety reasons, he voted against two conservatives. Both are fellow members of the East Renfrewshire conservative group with Stewart Miller being the tory group leader. Counciilors Millar and Carmichael are also the local ward councillors, with Cllr McCaskill representing the neighbouring ward of Stamperland. Why would he join forces with the administration in this matter, vote against his fellow conservatives and the ward councillors?. Councillor McCaskill was recently suspended by the conservative party when he joked about Islamic State spies moving in with Nicola Sturgeon. In a post on Twitter, councillor Gordon McCaskill suggested agents of the terrorist group would be willing to move in with the First Minister. The leader of the Conservative group in East Renfrewshire Council made the comments after Sturgeon said she would be "happy" to have a Syrian refugee stay in her home. McCaskill's tweet, which was later removed from his account, read: "Scenes we'd like to see: the refugees Nicola invites into her house are Daesh moles." The Scottish Conservatives suspended McCaskill with immediate effect and launched an investigation into his online comment. Earlier this year McCaskill was slammed for making "se-xist" comments about women in trade un-ions . He was recently re-instated to the party but not as group leader. It is known that privately he blames Jackson Carlaw for his demise from the candidates list for potential MP / MSP listing for the party. Jackson Carlaw has been very vocal in his objections against the Newford Grove proposal. Since the labour led administration of ER lost the first application they have been pulling out all of the stops. In what has been seen as very unusual moves labour councillors Mary Montague and Alan Lafferty both attended at a PTA meeting at Williamwood school in an atempt to shore up support for the council proposals. We approached councillor Millar for comment and he said "I don't want to comment at this time". ocal councilor was surprisingly quiet when we approached him for comment, and we asked if he had voted for the proposal and against the conservative group as he had issues with Jackson Carlaw. Cllr McCaskill failed to comment. 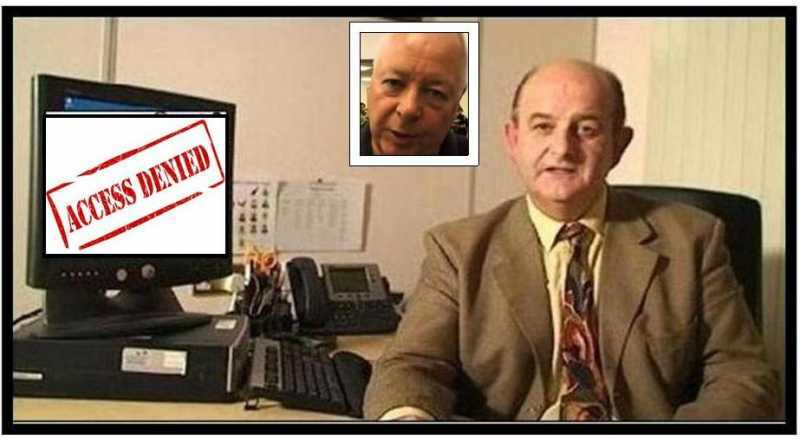 Jim Sneddon the Head of Democratic Services at East Renfrewshire Council failed to comply with Freedom of Information legislation. He was judged to have done so by the Chief Officer - Legal & Procurement at East Renfrewshire Council after a request for a review of Jim Sneddon's decision was submitted. Jim Sneddon had refused to answer a question put to him regarding the date of the so called second call for community council elections. "I am of the view that the information in question is held by the Council and should have been released to you in terms of your rights under the Act." ERC deny a resident his human rights ? The Deputy Chief Executive of East Renfrewshire Council, Caroline Innes has issued a banning notice to a resident of Clarkston. This residents crime - he is alleged to be the owner/moderator of a web discussion forum that she alleges is abusive and threatening to council staff and elected members and is displaying their photographs which she disapproves of. This resident was tried without his knowledge and convicted without the right to be present, hear the evidence and have legal representation. The first that he heard of this was when he received an email informing him that he was banned from contacting the council by telephone or letter. There is apparently no right of appeal against the conviction, as such, only an appeal against the sentence. The resident maintains that he is not the owner/ moderator of the web site and that he is the victim of a miscarriage of justice. However as he has no right of appeal against the conviction he feels that his human rights have been violated and he has been bullied and threatened by the council as they state that they may consider legal action and have referred an unknown matter to the Information Commissioner. Three senior members of East Renfrewshire Council staff have failed to respond to requests to attend a meeting to be held this evening in Newton Mearns to discuss the impending community council scheme. Chief Executive Lorraine McMillan, Head of Democratic Services Jim Sneddon and Community Planning team leader Tracy Butler were invited to this meeting but each one has failed to respond, even in the negative. They have simply blanked the organisers request for a yes or no as to their attendance. Unlike Kirsteen Oswald MP, who responded, and MSPs Jackson Carlaw, Stewart Maxwell and Ken McIntosh all of whom responded, and Minister for Local Government and Community Empowerment Marco Biagi MSP. The Scottish Public Service Ombudsman defines Maladministration to include 'failure to reply'. This meeting will see members of all ten East Ren community councils in attendance. The war drums are beating ! Is the chair of the ERC Audit and Scrutiny Committee - actually plugged in?